Gold Glimmers, and the Rush Is On! An expedition led by George Custer in the 1870s confirms that the rumor of gold is true, and now its glimmer beckons from the Black Hills of Dakota Territory. And the rush is on in spite of the threat of war with the Indians. No one seems to desire to strike it rich more than Jim Bannon, a farmer who seeks Alyssa McGuire's hand in marriage. Her father is the owner of the Bank of Cheyenne and refuses to let her marry below her class. So Jim boldly departs his Wyoming farm in hot pursuit of the wealth that is his ticket to the love of his life. But conflict between miners and Indians heats up, and Jim returns home unsuccessful. How will he ever make Alyssa his bride? 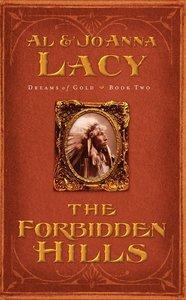 About "The Forbidden Hills (#02 in Dreams Of Gold Series)"
Readers are sure to be drawn to the heroic examples of Christian love in this second historical romance novel in the Dreams of Gold trilogy by these bestselling authors. Gold Glimmers, and the Rush Is On! When gold was discovered out West during the nineteenth century, men rushed from all parts of the globe to stake their claims. Fortunes were made and lost, families uprooted, and a continent shaped by men driven by dreams of gold. (end series header) Gold Discovered in the Black Hills! 1875. Jim Bannon is a young farmer, a fine Christian man in love with Alyssa Rose McGuire, the daughter of a wealthy banker in Cheyenne . Her father, Frank, wants her to marry a Christian, of course...but a wealthy Christian. So when the Black Hills of the Dakota Territory (and Sioux country) are opened for gold prospecting, Jim stakes a claim, hoping to strike it rich enough to win Alyssa’s hand with her father’s approval. Thousands of people converge on the Black Hills, seeking gold for everything from medical bills to oil investments. Jim realizes he’s in a mission field among the prospectors—and even the Sioux Indians. But will he ever find enough gold to satisfy Frank McGuire and marry his beloved Alyssa Rose? Best-selling author Al Lacy has written over one hundred historical and western novels, including the Angel of Mercy, Battles of Destiny, and Journeys of the Stranger series with more than 2.5 million books in print. ýJoAnna Lacy is Al's wife and longtime collaborator, and the coauthor of A Place to Call Home, Dreams of Gold, Frontier Doctor, Orphan Trains, Mail Order Bride, Shadow of Liberty, and Hannah of Fort Bridger series. The Lacys make their home in the Colorado Rockies. News that gold has been discovered in Canada's Yukon Territory is rapidly spreading through the United States and its territories. And the route that gets you there from Alaska is the Golden Stairs. In the spring of 1898, nineteen-year-old Livia Bray and her mother, Martha, set out to find their missing father and husband, Weldon, who left six months ago to seek his fortune. Her heart just broken, Livia does not expect to meet anyone like Matt Holden on the Golden Stairs. But Matt saves Livia's life during an avalanche and leads her to a saving knowledge of Jesus Christ. Livia also finds true love in him...but will she and her mother find her father dead or alive? Introducing a new trilogy called Dreams of Gold, master narrators Al and JoAnna Lacy tell the stories of three major gold strikes that took place in North America in the nineteenth century. Craig Turley, the son of a wealthy Manhattan business owner, longs to make his way in the world. Kathy Ross is the twenty-year-old family governess who cares deeply for Craig and secretly prays for his salvation. As word spreads across the country of the gold strike in California, Craig leaps at the opportunity to forge his own success. But when Craig finds that his shack has been broken into and all of his fortune has been stolen, could it be that God is trying to send him a message? Has God allowed this in his life in order to bring him to surrender? Will this prodigal son find his way home to recover all that God has truly intended for him?